Ashland Inc. is an American Fortune 500 company which operates in more than 100 countries. Headquartered in Lexington, Kentucky, in the United States, the company traces its roots back to Ashland, Kentucky (for which it is named). Ashland was founded in 1924 as Ashland Refining Company of Ashland, Kentucky, by Paul G. Blazer. In October 1923, J. Fred Miles of the Swiss Oil Company of Lexington, Kentucky. hired Mr. Paul G. Blazer to locate, purchase and be general manager of a refinery in eastern Kentucky. Keeping in mind the transportation advantages of access to the Ohio River, a refinery built in 1916 in northeastern Kentucky, where the Big Sandy River joins the Ohio River was selected. With funds supplied by Swiss Oil, Blazer arranged to buy, at a price of $212,500, the little 1,000 barrel per day refinery of Great Eastern Refining Company which had been owned by coal operators out of Huntington, West Virginia. The venture of these coal people into oil refining had proved unprofitable and they were glad to sell their refinery, including a small towboat and oil barge. On February 2, 1924, Blazer and three Swiss Oil executives incorporated Ashland Refining Company, with a paid in capital of $250,000. They took over the operations of the Catlettsburg Refinery which had twenty-five employees who were working seven days per week and twelve hours per day. Blazer moved from Lexington to Ashland. The only member of the Swiss Oil organization to come to Ashland with Blazer was Ashland Refining Company's first treasurer, William Waples. Ashland's refinery operations were successful from the very first month. Wages were increased and the hours of work were reduced. After making repairs and purchasing some new equipment, the refinery soon had output of 500,000 barrels a year and sales of $1,300,000. Within a few years, Ashland Refining Company, the small subsidiary of Swiss Oil formed solely to facilitate the purchase of some eastern Kentucky oil producing properties, began showing larger earnings than the parent company. Ashland Refining Co. grew rapidly through both internal expansion and acquisitions including Union Gas and Oil Company (1925), Tri-State Refining Company (1930), and Cumberland Pipeline Company (1931). By 1933, Ashland Refining Company owned more than 1,000 wells, 800 miles of pipelines, bulk distribution plants in twelve cities, service stations, river transportation terminals and river equipment. In 1936, under Blazer's leadership, the company ownership changed from Swiss Oil to the Ashland Oil and Refining Company shareholder group in Ashland, Kentucky. Blazer was appointed chief executive officer of the company. Blazer's success as manager was recognized by major stockholders. They gave him the power to run Ashland as his own operation, though at no point during his tenure as chief executive officer (1936–1957) did he own a controlling interest in the company. Two of his early changes were offering employees' sick leave with full pay and in 1947 the introduction of an employee profit-sharing plan, which made Ashland Oil and Refining Company one of the first companies in the region to offer such benefits. Blazer also started the well known tradition of having local Greenup County educator and internationally acclaimed author Jesse Stuart open each annual meeting with a story, a poem, or a bit of humor. He also was a pastor at his local church. After World War II, Ashland teamed with Sperry Corporation to develop the introduction of radar on commercial river vessels and teamed with various shipyards to develop the integrated tow. The "jumbo" tank barge of 195 ft. by 35 ft. became the industry standard. Ashland was growing from a small Eastern Kentucky refinery into a Forbes 500 company by relying on barges to bring in crude oil and deliver refined products to independent marketers. In the process, Ashland soon operated the nation's largest inland towing fleet and in 1953 the Port of Huntington-Tristate exceeded Pittsburgh as the busiest port on the Ohio River. Following World War II, Ashland Oil & Refining Company acquired Allied Oil Company (1948), Cleveland and Lakeland Tankers (1948), Aetna Oil Company (1949), Freedom-Valvoline Company (1950), Frontier Oil of Buffalo (1950) and National Refining Company (1950). By 1953, Ashland Oil and Refining Company had 3,518 miles of crude oil pipelines, 252 miles of product lines, six refineries processing an average of 124,000 barrels a day, operated nine tow boats on the inland waterways, and owned over 100 barges. Although still involved as chairman of Ashland's Finance Committee and Executive Committee, Blazer stepped down as chief executive officer in 1957. Louisville Refining Company was purchased in 1959. United Carbon was purchased in 1963. In 1966, Ashland Oil and Refinery Company Inc.'s sales had grown to $699,000,000. Diversification continued with the purchase of Warren Brothers in 1966, which later was to become Ashland Paving and Construction. A significant acquisition was made in 1967 when the company purchased ADM Chemical Group; whose chemical distribution business would go on to be one of the primary businesses of the company in the later part of the 20th century. In 1969, the company reorganized to form Ashland Petroleum, as well as entering into a joint venture in Coal mining under the name Arch Mineral. In the 1980s and early part of the 1990s, Ashland continued to expand, buying The Permian Corporation and merging it with Scurlock Oil Company in 1991 to form a subsidiary known as Scurlock Permian Corporation. In 1992, most of Unocal's chemical distribution business was acquired, making Ashland the top chemical distributor in North America. At this time, the Industrial Chemicals & Solvents (IC&S) division was established. The company's name was changed from "Ashland Oil" to the present "Ashland Inc." in 1995, which noted the reduced importance of oil in the overall business. In 1998, the petroleum division merged with Marathon Oil to form Marathon Ashland Petroleum, LLC (MAP). 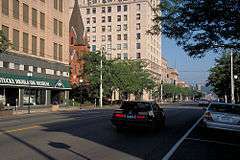 Following that in 1999, Ashland agreed to sell its Scurlock Permian subsidiary to Plains All American Pipeline and the headquarters were moved from Russell, Kentucky, to Covington, Kentucky, although the company maintains an office in Russell. A monumental change came in 2005, when Ashland sold its shares of the Marathon Ashland Petroleum joint venture to Marathon Oil, effectively dissolving the remnants of their petroleum division. After the sale, the company was no longer involved in the refining or marketing of fuels. The original oil refinery in Catlettsburg, Kentucky, is still in operation today and is owned and operated by Marathon. In 2006, Ashland sold APAC (the paving and construction division) to the Oldcastle Materials subsidiary of Oldcastle Inc. of Dublin, Ireland. Ashland purchased the adhesive and emulsions divisions of Air Products & Chemicals in 2008. Ashland announced plans to acquire Hercules Inc. on July 11, 2008, for $3.3B. On November 13, 2008, the transaction was completed. In July 2010 Ashland merged its foundry chemicals activity with Süd-Chemie of Munich, Germany, to form ASK Chemicals L.P. with headquarters in Dublin, Ohio. In November 2010 Ashland announced plans to sell its distribution business known as Ashland Distribution to TPG Capital for $930 Million. The Ashland Distribution business had been a part of Ashland since 1969. With revenues of $3.4 billion, the Ashland Distribution business had approximately 2,000 employees across North America and Europe, and entered the China plastics market in 2009. The sale was finalized April 1, 2011, with a final sale price of US$979 million. The new privately held company is named Nexeo Solutions. In May 2011 Ashland announced that it had bought the privately owned company International Specialty Products Inc. (ISP) for $3.2 billion. ISP is a supplier of specialty chemicals and performance-enhancing products for consumer and industrial markets. Valvoline Instant Oil Change moved into the Southern California area in March 2012 when the EZ Lube franchise had been purchased by Henley Enterprises, VIOC's largest franchisee. In 2014, Ashland Water Technologies was sold to a private equity buyer. The company currently has four wholly owned divisions, which include Ashland Specialty Ingredients, Ashland Water Technologies, Ashland Performance Materials, & Ashland Consumer Markets (Valvoline). The Specialty Ingredients division offers products, technologies and resources for formulation and product performance. The markets for the products include personal care, pharmaceutical, food and beverage, coatings and energy. In May 2011 Ashland bought the company ISP inc, which was planned to be incorporated into the Ashland Specialty Ingredients division. Combining the Casting Solutions, Composite Polymers, and Specialty Polymers & Adhesives businesses, Performance Materials provides products for the construction, packaging, transport, marine, and metal casting industries. Twenty nine manufacturing facilities are located in 15 countries around the world. Casting Solutions makes Foundry Binder Resins, chemicals, sleeves, and filters for the metalworking industry. The Composite Polymers business sells unsaturated polyester resins, vinyl ester resins, and gelcoats, for use in Composites. Finally, the Specialty Polymers & Adhesives business manufactures various adhesives and resins for the transportation, aerospace, and construction industries. Valvoline is one of the largest producers of motor oil in the United States. Valvoline was founded by Dr. John Ellis who formulated a petroleum-based lubricant in 1866 and trademarked the Valvoline name in 1873 in Binghamton, New York. Currently, Valvoline World Headquarters are in Lexington, Kentucky. Valvoline is the oldest motor oil marketer in the United States. In North America, Valvoline is divided into two main sections. 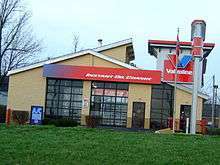 The "Do it for me" (DIFM) business, which includes over 800 company and franchise Valvoline Instant Oil Change locations; a contractual "non franchise" branch of automotive care facilities named Valvoline Express Care; and the generally supply agreement only "We Feature" outlets. The "Do it yourself" (DIY) business includes automotive-related products. Included in these are Valvoline lubricants, along with Car Brite commercial automotive appearance products, Eagle One consumer automotive appearance products, Pyroil automotive chemicals, and Zerex antifreeze. Outside of North America, the company has very few auto care businesses, but rather focuses on selling to consumers as well as OEM manufacturers. Valvoline operates in the United Kingdom from Birkenhead, Merseyside. Valvoline has sponsored several NASCAR and IndyCar drivers, including Buddy Baker (1983–1984), Ron Bouchard (1985–1986), Neil Bonnett (1987–1988), Morgan Shepherd (1989), Mark Martin (1992–2000); Al Unser Jr. (1988–1993); Robby Gordon (1994–1996), Gil de Ferran (1997–1999); Johnny Benson, Jr.; Scott Riggs, Patrick Carpentier, A. J. Allmendinger, Matt Kenseth, Greg Biffle; Ricky Stenhouse, Jr.; Carl Edwards, Trevor Bayne, and Casey Mears. Valvoline was an official lubricant partner of Marussia F1 Team later Manor Marussia F1 Team in 2014-2015. Valvoline was co-owner of NASCAR Cup team MBV Motorsports from 2001 to 2005. The brand began sponsoring Hendrick Motorsports starting in 2014. Valvoline has also sponsored NHRA drivers Tony Schumacher, Jack Beckman, Antron Brown, Matt Hagan, Spencer Massey, and Ron Capps. Valvoline also has a long history in Australia. Long time Sydney radio personality John Laws was used in television advertisements to promote their oils during the 1980s and 90s with the line "Valvoline, you know what I mean" becoming a popular catchphrase. It has also had a long association with legendary Australian Sprintcar driver Max Dumesny with their colors appearing on his three Australian Championship winning sprintcars, his seven World Series Sprintcars championship machines, his Australian Superspeedway Championship winning NASCAR, and during his brief foray into V8 Supercars. It has been involved with Garry Rogers Motorsport since 1990, winning the 2000 Bathurst 1000. (Note: Ashland divested this segment in August, 2014, sold to private equity for $1.8 billion). In the Water Technologies division, Ashland makes chemical and non-chemical water treatment products for industrial, commercial, and municipal customers. This includes influent and wastewater treatment, and boiling and cooling water treatment chemicals. Ashland acquired the French company OTENE in 2000, and Degussa AG's water treatment business in 2006. In late 2008 with the closure of the Hercules Inc. acquisition, the water and papers division was created with expected revenues in excess of $2 billion. In June 2009, the Drew Marine division of Ashland Water Technologies was sold to J. F. Lehman & Co. for approximately $120 million. Drew Industrial remained an operating business of Ashland Water Technologies. As of 2013, Valvoline is the only major lubricant brand that mass-produces a motor oil consisting of at least 50% recycled and re-refined base stock. 1 2 3 4 5 6 "Ashland, Form 10-K, Annual Report, Filing Date Nov 19, 2012" (PDF). secdatabase.com. Retrieved Jan 15, 2013. ↑ "Corporate History". Ashland Inc. 2007. Archived from the original on 9 May 2007. Retrieved 2007-05-08. ↑ John E. Kleber Editor-in Chief, The Kentucky Encyclopedia: Blazer, Paul Garrett (Lexington : University of Kentucky Press, 1992)Page 87. 1 2 3 "E Pluribus Unum!" "One Out of Many" An Oil Company Grows Through Acquisitions, An Address at Lexington by member Paul G. Blazer, American Newcomen Society, copyright 1956 Page 9 (PDF). 1 2 3 "Ashland Inc. History: Petroleum Archives Project - Arabian Peninsula & Gulf Studies Program - University of Virginia - Prepared with support from The Kuwait Foundation for the Advancement of Sciences". ↑ John E. Kleber Editor-in Chief, The Kentucky Encyclopedia: Ashland Oil, Inc. (Lexington : University of Kentucky Press, 1992)Page 37. ↑ "National Mississippi River Museum & Aquarium - Achievement Award Winners - Robert "Bob" L. Gray". ↑ "National Mississippi River Museum & Aquarium - Achievement Award Winners - William J. Hull". ↑ "Michael C. Robinson: National Waterways Study – U.S. Army Engineer Water Resources Support Center – Institute for Water Resources: History of Navigation in the Ohio River Basin 1983 Page 39" (PDF). ↑ "Ashland, Form 10-K, Annual Report, Filing Date Dec 8, 1994". secdatabase.com. Retrieved Jan 15, 2013. ↑ "Ashland, Form 8-K, Current Report, Filing Date Dec 12, 1997". secdatabase.com. Retrieved Jan 15, 2013. ↑ "Plains All American Pipeline, Form 8-K, Current Report, Filing Date May 27, 1999". secdatabase.com. Retrieved Jan 15, 2013. ↑ "Ashland Inc. to move headquarters to Covington, Ky. - Louisville - Louisville Business First". ↑ "Ashland, Form 8-K, Current Report, Filing Date Jun 29, 2005". secdatabase.com. Retrieved Jan 15, 2013. ↑ "Ashland, Form 8-K, Current Report, Filing Date Aug 21, 2006". secdatabase.com. Retrieved Jan 15, 2013. ↑ "Ashland, Form 8-K, Current Report, Filing Date Jun 9, 2008" (PDF). secdatabase.com. Retrieved Jan 15, 2013. 1 2 "Ashland, Form 8-K, Current Report, Filing Date Jul 14, 2008". secdatabase.com. Retrieved Jan 15, 2013. ↑ "Ashland, Form 8-K, Current Report, Filing Date Nov 14, 2008" (PDF). secdatabase.com. Retrieved Jan 15, 2013. 1 2 "Ashland, Form 8-K, Current Report, Filing Date Nov 10, 2010". secdatabase.com. Retrieved Jan 15, 2013. ↑ "Ashland, Form 10-Q, Quarterly Report, Filing Date Aug 5, 2011" (PDF). secdatabase.com. Retrieved Jan 15, 2013. 1 2 "Ashland, Form 8-K, Current Report, Filing Date May 31, 2011". secdatabase.com. Retrieved Jan 15, 2013. ↑ "EZ Lube is now Valvoline Instant Oil Change - Cheap Oil Change Coupons". ↑ "> FAQs > Our Business > Company Overview". Valvoline.com. Retrieved April 12, 2013. 1 2 3 "Riggs to Drive No. 10 Valvoline Pontiac". Race2Win. October 23, 2003. Retrieved September 24, 2013. ↑ "Patrick Carpentier NASCAR Sprint Cup Results (races)". Racing-Reference. Retrieved September 24, 2013. ↑ "A.J. Allmendinger NASCAR Sprint Cup Results (races)". Racing-Reference. Retrieved September 24, 2013. ↑ "Matt Kenseth – Valvoline Racing – Phoenix Advance". Speedway Media. November 9, 2010. Retrieved September 24, 2013. 1 2 3 4 5 6 7 8 9 10 11 "Drivers and Crew Chiefs". Valvoline Racing. Retrieved September 24, 2013. ↑ "Valvoline to partner with Hendrick Motorsports". Hendrick Motorsports. September 24, 2013. Retrieved September 24, 2013. ↑ CentralQueenslander (2 November 2013). "Valvoline Commercial with John Laws - Channel 9 Brisbane (1995)" – via YouTube. ↑ "Ashland, Form 8-K, Current Report, Filing Date Mar 30, 2006". secdatabase.com. Retrieved Jan 15, 2013. ↑ "Ashland, Form 8-K, Current Report, Filing Date Jun 23, 2009" (PDF). secdatabase.com. Retrieved Jan 15, 2013. ↑ "Frequently Asked Questions". Valvoline NextGen.